"Together! A New Alberta Team." Even back in 1986, when Alberta's ruling PCs had been in power for a mere fifteen years (! ), the provincial Tories understood the importance of brand renewal. 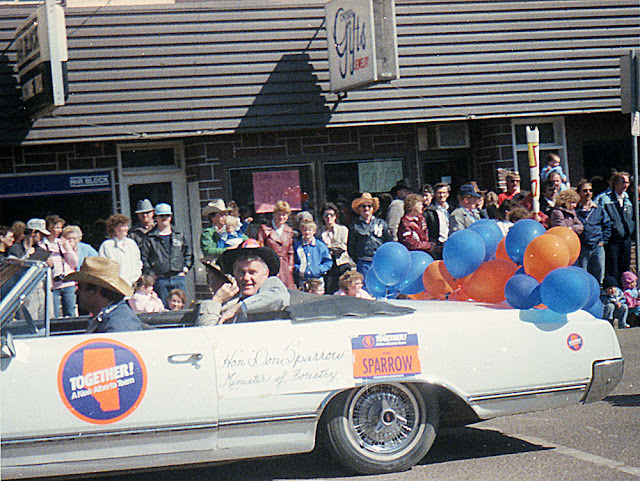 This was new PC Leader Don Getty's first election as Premier, and the election slogan seen here was part of that renewal strategy. The 1986 election was held on May 8; the folder containing the negative for this photo is stamped May 1986. Other photos on the same roll of film imply that this was Leduc's Black Gold parade, which is normally held in early June these days, but perhaps back then it occurred earlier. The party livery on the car hints that this is a pre-election shot, and yet Don Sparrow is identified as Minister of Forestry, a title he shouldn't have been using during an election, since cabinet is dissolved during the writ period. Of course it's also possible that this shot was taken after the election, but the orange and gold branding certainly makes it look like a campaign car. I volunteered for Mr. Sparrow during the 1986 election, back before I realized that my values and those of the PCs didn't really align very well. That being said, I thought Sparrow himself was a pretty good guy (I have vague memories of playing on the youth baseball team his company sponsored), and I was saddened when I heard of the fatal car accident that took his life not long after he lost his seat to Alberta Liberal Terry Kirkland in the 1993 election. Progressive Albertans may be frustrated by the PC ability to constantly rebrand itself as somehow new, but parties are composed of people, and from my limited interaction with Don Sparrow he seemed like a man who simply wanted to serve the public to the best of his ability. Whatever party colours we fly, we all belong to the same civilization, and I'm sure Sparrow had much more to contribute during his post-government career. The rodeo used to be held on the first weekend in May back then, I am not sure when that changed though.